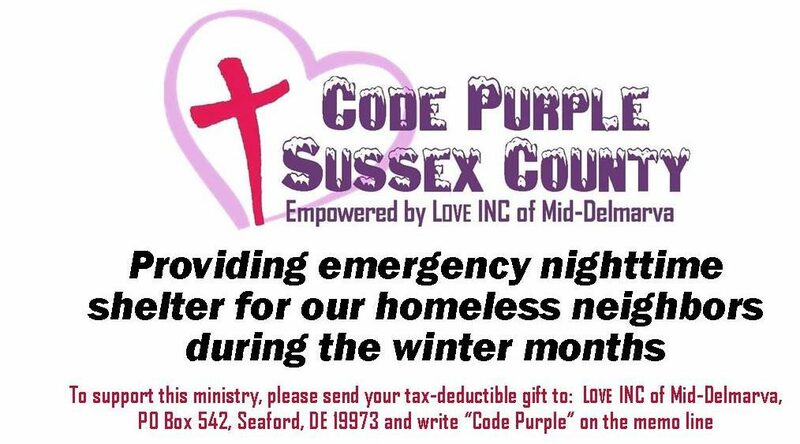 With the risk of snow/rain showers and real feel temps being below 32 degrees for Friday & Saturday nights, and the low for Sunday night being 31, we will call Code Purple in effect till Sunday, March 19th, 2017. Need volunteers to sign up for intake, dinner, and overnights. Please call Tammi at 302-242-8076 about volunteering or Vikki at 302-853-0997 for dinner. Use our calendar at Volunteer Calendar! St. Luke’s Episcopal Parish House: 202 N North Street, Seaford, DE. Call Nikki Gonzalez at 302-519-0024. In-take 7pm to 9pm. Dinner at 7pm. All those seeking shelter in Western Sussex County must arrive for in-take and then the women and children will be transported to Gateway Fellowship. St. Luke’s will shelter men only! Gateway Fellowship: 8110 Cannon Road, Bridgeville, DE. Call Nikki Gonzalez at 302-519-0024. Women to meet at St. Luke’s Parish House for in-take 7pm to 9pm. Transportation will be available at 9pm and then 745am the next morning back to Seaford. This shelter will be for women and children only. Avenue United Methodist Church: 20 N Church Street, Milford, DE. Call Nikki Gonzalez at 302-519-0024. Men ONLY in-take at 7pm. Dinner served at 7:30pm. Georgetown Presbyterian: Call Pastor Mike at 302-344-1912 or leave a message at the Church 302-856-6842. This sanctuary is open for extreme weather and not held a certain temperature. MUST CALL AHEAD! Eastern is unique as they operate cold weather month’s shelter. Their shelters are open and will remain open until spring regardless of the temperature. Day Center: Rehoboth CRC open to the homeless on Tuesdays and Wednesdays for showers, laundry, and job finding assistance. Call 302-227-1340 with any questions. Milford Community Center: Milford, Sanctuary, Please call the center at 302-725-0770 or Pastor Richie 302-249-5738 to make an appointment to stay at the shelter. Serving women and children only.